Let's face it: current general manager Ken Holland's not leaving the Detroit Red Wings anytime soon. That is, unless you're one of those who believe he's the front-runner for the GM post with Seattle. In Detroit, Holland's as much of a legend as the players who hang from the rafters at Little Caesers Arena. Having built the championship teams of 1998, 2002 & 2008 as GM, you could argue that Holland deserves to be inducted into the Hockey Hall of Fame's builder category. But Mr. Holland's put himself, and the Wings, in a salary cap mess over the past few seasons. Massive contract extensions to defensemen Danny DeKaiser and Jonathan Eriksson have handicapped the Red Wings as their salaries make them seem overpaid for the play they provide. Dishing out multi-year deals to free agents over the age of thirty also seems to be counterproductive since the Wings clearly have a need to become younger. Holland's deal with the Vegas Golden Knights' last season is exactly the type of transactions the Wings will need over the next two years as they rebuild. 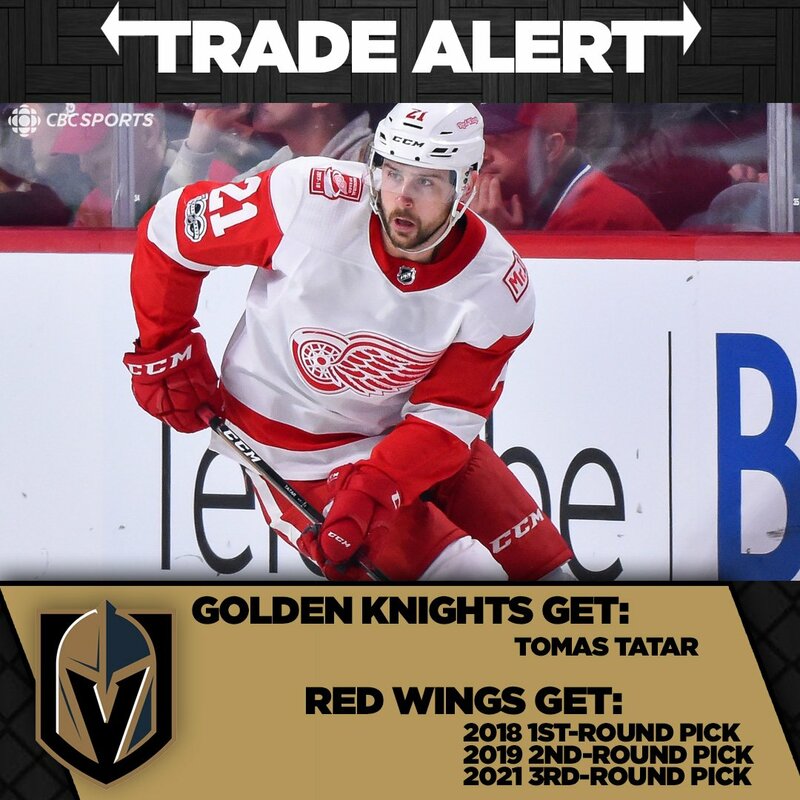 Tatar, a member of the Red Wings for seven seasons, only ended up playing twenty regular season games for the Knights before being flipped to the Montreal Canadiens this past fall in a package for Max Pacioretty. Forwards Gustav Nyqvist and Thomas Vanek, defenseman Niklas Kronwall and goaltender Jimmy Howard are the notable pending unrestricted free agents who can walk away from Detroit on July 1st, 2019. While teams typically try to get some return on expiring contacts by the trade deadline for players that they have no interest in re-signing, the Wings are likely to let franchise faces Kronwall and Howard decide their own fates out of respect for all their years of dedication and service to the club. In the case of Nyqvist and Vanek, however, things are a little murkier. According to Capfriendly.com, both players have no-trade clauses in their contracts, which means they can veto any deal to a city that they'd rather not play in. Therefore, all four significant and potential trade baits for the Wings are in control of their own destinies, which puts a hamper on collecting picks and prospects for a rebuild. Other UFAs include lesser known but yet serviceable players such as defensemen Nick Jensen and Luke Witkowski, but its doubtful Holland gets anything significant in return for them. Translation: don't expect a Tatar-type return for either of these two. On the other hand, both Nyqvist and Vanek may want to waive their no-trade clauses for a chance to play for a playoff team. Then again, they may choose to play out the year and wait until July 1st to field offers. Red Wings legend Steve Yzerman is a free agent. No, he won't be lacing up his skates and coming out of retirement to help, but rather he could be a great replacement for Ken Holland as GM. Yzerman stepped down from his role as GM in Tampa Bay where, he along with present GM Julien Brisebois, constructed the Lightning that the league knows and loves today. Yzerman stepped down because 1) he wants to be closer to home 2) he's likely looking for a new challenge. Brisebois, who was Yzerman's assistant for years, was likely going to get a job as a GM somewhere and Tampa owner Jeff Vinnik likely had no interest in losing his services. Therefore, Yzerman will likely want to come back to Detroit and rebuild the club that he led as captain through their glory years of the 1990s. Yzerman would be able to mold these Detroit Red Wings into the team he wants, and this is a challenge that all GMs embrace: getting to put your own stamp on the team. While this is all yet to be determined, its hard not to imagine this scenario playing out this summer. Besides, everyone loves a homecoming and Stevie Y would become a savior yet again for this storied franchise. Current Red Wings head coach Jeff Blashill has a record of 119-125-44 over three and a half seasons (including this year) behind the bench, which is equivalent to a winning percentage of .490. The Red Wings made the playoffs in Blashill's first season (2015-2016), but since then the team has lost more games than they've won. Having only this year left on his deal, he's likely not returning and thus would give Yzerman an opportunity to hire his own coaching staff. With plenty of head coach possibilities abound, some established (Alain Vigneault, Joel Quinneville) some waiting-in-the-wings (Sheldon Keefe, Dallas Eakins), Yzerman will likely choose someone who will help his young team grow. Yzerman hired current Bolts coach John Cooper after letting go of Guy Boucher many moons ago. Yzerman will likely give whomever he chooses a long leash, and based on how Cooper coaches, might want a "player's coach", someone who's more technical rather than a tactician. Defensemen Dennis Cholowski (20-years-old) and Filip Hronek (21-years-old) are on the Wings roster this year but are part of the youth movement on the blueline going forward. Prospects Jared McIssac, Joe Hicketts and Gustav Lindstrom are all under 23-years-old and could join the defensive unit in the near future. Last summer's prized first round draft pick, Filip Zadina, fell all the way down to the Wings at #6 overall, after many pundits had him going in the top three selections of the 2018 NHL Draft. Zadina's a skilled scoring winger who could quickly become a household name in Detroit in the not-too-distant-future. Keep an eye out for Givani Smith, a 2nd round pick back in 2016. Now twenty-years-old, he'll likely get every opportunity to make an impression on the Wings as a character, bottom-six forward. He just needs more time to develop. And don't forget about these current young stars that the Wings are grooming. Dylan Larkin, Anthony Mantha and Andreas Athanasiou have yet to reach their primes and they're all under twenty-five-years-old. Heck, let's add Tyler Bertuzzi to this list too. While we're at it, youngster Michael Rasmussen has also made his mark on Detroit fans too. These young forwards either continue to grow and become the new faces of the Red Wings rebuilding franchise, or can be used as trade bait in case Yzerman (or Holland) get a deal they just can't refuse. Either way, with 12 picks in this summer's 2019 NHL Entry Draft, the Red Wings are primed to continue their plan to draft and develop. Next season (if there is one), a lot of general managers around the league will be preparing in advance of the Seattle expansion. After many teams got fleeced by Vegas GM George McPhee during the last expansion draft (Florida Panthers, I'm talking about you! ), teams will be ready this time around. The Red Wings will also be primed for the draft, especially if Holland (or potentially Yzerman) is shrewd with his spending on free agents this off-season. But in the summer of 2020, the Red Wings will be losing a player to the NHL's 32nd team. Luckily for them, since they'll be rebuilding and could have a few veterans leave via free agency, the Wings won't lose a player of significance as it currently stands. In fact, Detroit's likely to get some much needed cap relief from Seattle since they'll expose their long term contracts and bubble players as those who the new team can claim. Seattle can enjoy selecting from the likes of Eriksson, defenseman Trevor Daley and perhaps overpriced veteran forwards Justin Abdelkader and Frans Nielsen. And if the Seattle (Kraken? Emeralds? Sea Lions?) opt to not take on one of many of Detroit's expensive contracts, the Wings will be able to manage another year with those contracts on the books. GET YOUR MOTOR RUNNING FOR SUMMER 2020! According to Capfriendly, the Red Wings will have just under $40-million in cap space come summer 2020. That's plenty of dough to spend on reshaping the team. At that point, they'll have five restricted free agents; forwards Mantha, Athanasiou and breakout forward Tyler Bertuzzi the biggest names of the bunch. Depending on how Holland or, again hypothetical, new GM Steve Yzerman views these young stars, Detroit will have money to spend. They'll have finally finished paying out semi-retired Johan Frazen's contract by then, as well as the buyout cap hit for Xavier Ouellet and, depending how/what they can recapture for 2020's pending UFA's via trade, the Wings could be ready to dip back into free agent frenzy with a real purpose. Not to mention, who knows what young gun Zadina will look like by then! Summer of 2020 will be a good time to be a Detroit Red Wings fan, and the team could look significantly different than it does today. And maybe, just maybe, the Red Wings be a well-oiled machine by then and be built as a playoff contender for decades to come. Thanks in advance, Stevie Y!